This past week I had made some killer caramel frosting. However, I didn’t have anything to slather it on top of. 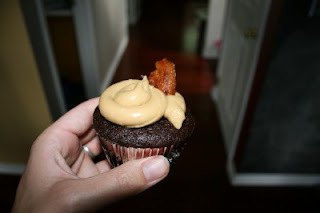 After eating several spoonfuls, waiting for inspiration, it came to me….. chocolate cupcakes, topped with caramel frosting, topped with CANDIED BACON. 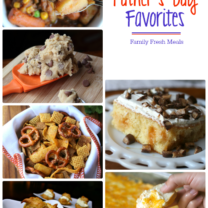 The girls and I love bacon, and I had heard about candied bacon on the Food Network…. so why not!? 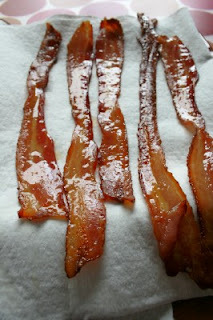 I found a super easy and quick recipe for this sweet bacon treat on the Food Network site and gave it a whirl. 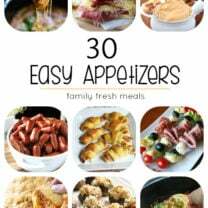 Very easy, very tasty, very fun. And not too bad for you health-wise. 1. 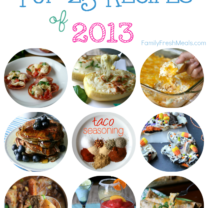 Preheat the oven to 400 degrees F. Place a baking rack on a sheet pan. 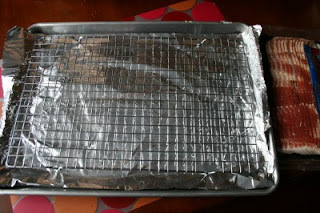 I lined my sheet pan with foil for easy clean up. 2. Arrange the bacon in 1 layer on the baking rack. 3. 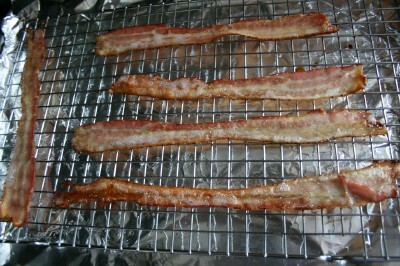 Bake for 15 to 20 minutes, until the bacon begins to brown. 4. Remove the pan carefully from the oven; there will be hot grease in the pan! Brush the bacon slices with maple syrup and bake for another 3 to 5 minutes, until the bacon is a warm golden brown. 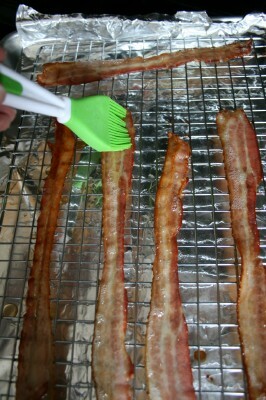 Transfer the bacon to a plate lined with paper towels and serve warm. Or……. 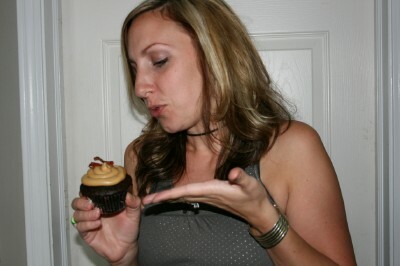 …… place it on top of a delicious caramel chocolate cupcake! 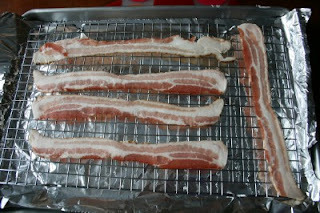 Place a baking rack on a sheet pan and arrange the bacon in 1 layer on the baking rack. Bake for 15 to 20 minutes, until the bacon begins to brown. Remove the pan carefully from the oven; there will be hot grease in the pan! 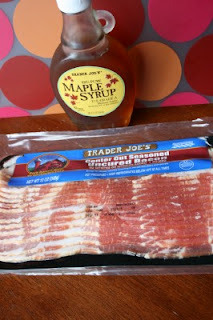 Brush the bacon slices with maple syrup and bake for another 3 to 5 minutes, until the bacon is a warm golden brown. Transfer the bacon to a plate lined with paper towels and serve warm. Hello, I love reading through your blog, I wanted to leave a little comment to support you and wish you a good continuation. Wish you best of luck for all your best efforts. Network Rack, Server Racks. Hello, I love reading through your blog, I wanted to leave a little comment to support you and wish you a good continuation. Wish you best of luck for all your best efforts. Server Racks Cabinet, Network Rack.